I knew I wanted to be a pro cyclist when: I returned to good form in the U23 category, which enabled me to think about turning pro. When I was a junior, I was not assuming I would be a professional bike rider, but I didn’t rule it out either. Greatest racing memory: Great War Remembrance Race. It was a breakthrough performance for me on the international scene since I got second place. Prior to that event I’d had a long block of races and I was very happy with the fact that despite so much racing I was still in good form. Race I dream of winning: Paris–Roubaix and Ronde van Vlaanderen. They are the most iconic, legendary and historical races and they suit me. If I wasn't a pro cyclist: I don’t see myself as anyone else. When I was 7, I told my parents I wanted to become a professional athlete. Before that I wanted to drive a garbage truck, but I’m past that phase. 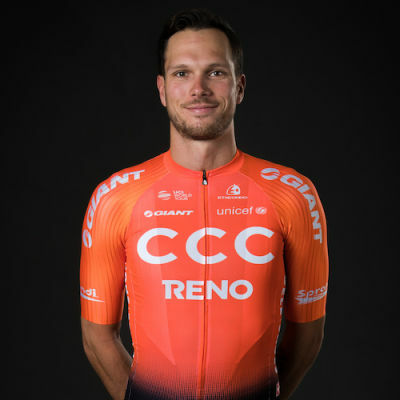 All-rounder Paweł Bernas signed his first professional continental contract in 2016 after a breakout season marked with stage and overall victories at Volta ao Alentejo and Szlakiem Grodów Piastowskich, as well as a stage win and second place at GP Liberty Seguros. He also took bronze at the Polish National Championships that year. Bernas lost most of 2016 season due to back injury, but later returned to good health and form. He finished 2017 with 20 top-10 finishes, which helped him ink a deal with CCC Sprandi Polkowice for 2018 season.